I’m in the process of redesigning this blog and working more intentionally on branding, so I haven’t been posting. But I couldn’t let this moment past. You can see the post below as a kind of follow-up to a brief post I did several years ago. Rochelle and I saw ‘The Help’ this weekend with another couple from church. They are wonderful people and gave me the book last year. Since the wife of the other couple, like me, is from the south, she thought I would resonate with the book, and in many ways I did. I was born in Jackson, MS, as were my parents and grandparents. Both of my grandmothers were maids in Jackson, working for multiple white families. ‘The Help’ nails the look of Jackson and its cultural and racial ethos – both in the 60’s and today. From my read – visiting hundreds of times over my lifetime – Jackson remains two cities; one white, one black. Speak with contemporary Jacksonians, white and black, and you’ll get a completely different picture of the city, just like you do in ‘The Help’. The whites in the movie don’t see a racial problem in Jackson while it’s painfully obvious to blacks. It’s been interesting to see the response of my white friends to ‘The Help’ (and I have tons of them and I love all of you). What has startled me is the amazement by which they look at the racial division in the 60’s. The white characters in ‘The Help’ are largely unlikeable. They want separate bathrooms, believe in separate stations in life, and mindlessly go along with the status quo; a status quo which occupies a social position of separate and unequal and the theological position that God did not create all people in his own image. When we see it in Mississippi in the 60’s we look back and marvel with confused awe and disgust. Some of us even think, “How could people be that way?” But many of us don’t think that most Sunday mornings when we sit in our segregated churches. Our senses get offended when someone like Hilly Holbrook speaks of segregated bathrooms because “niggers carry different diseases than us”. But that’s hardly a concern at most congregations I know. There’s no fear of black butts on white toilets because there are no black butts in the building. If you don’t believe me, what’s the racial make-up of your congregation. I bet most of them are OVERWHELMINGLY homogeneous. As a matter of fact, that’s how the church-growth experts tell us is the best way to grow a church. Once, in college, I sat in a ministry class and listened to a young white woman explain that segregated churches are better because different ethnicities like different worship styles. It would seem that the apostle Paul didn’t consider the powerful importance of “worship styles” when he said that Jesus Himself was our peace and had destroyed the the barrier, the dividing wall of hostility between us (Eph. 2:14). Apparently, even the church is inventing mythical reasons to keep the races separate. Shockingly, this is antithetical to the message of the New Testament, wherein one of the central questions is bringing Jews and Gentiles together as one under the lordship of Jesus Christ. Just this last week on Twitter, someone referenced seeing ‘The Help’ and asked, “I wonder what our kids will look back at and be embarassed?” I submit, it will be the same thing…at least if they’re better Christians than we are. Jesus Himself prays that all his disciples be one (John 17), and Paul works for it throughout his entire ministry, yet it is the least talked about issue in the church. We get all in a bunch about things we can’t do anything about; real important things like millennial debates, and hardly lift a finger to do what was critical to Jesus and Paul, bringing people from different backgrounds together to become one. The difficult and deadly work of ending Jim Crow and segregation in the south was undertaken by courageous men and women, who under the banner of Christ, sought to end a wicked, demeaning system of life. Yet it was the white churches in the South who were last to the party. In fact, they openly defended the status quo, rebuked Martin Luther King, Jr., and called to uphold segregation and second-class citizenship. These churches and their leaders saw nothing wrong with segregation, with white, blacks, Latinos and anybody else all worshipping separately, though supposedly to the same God. Some churches still do this. Some churches maintain racists systems in the David Duke kinda way. But the majority maintain it by not caring at all, not working to end it, not standing up for others and by sitting on their hands…in the theatre. There’s no need for me to add my voice to cacophony out there telling the world why Harold Camping has been before and is currently wrong about the Rapture and coming apocalypse. For Christian insiders like me, it began as a joke; another nut with extraordinarily poor textual criticism skills shouting from the rooftops about the end of the world. Then it turned slightly more maddening as we realized that some naive believers were following Camping, but worse, his crazed misconceptions about Scripture and Jesus were becoming a obstacle to faith for those searching for faith and another obstruction for those already opposed to it. But in these last hours, I’ve become more understanding of both Camping and some of his followers, not of their eschatology, mind you, but their emotions; their longing. 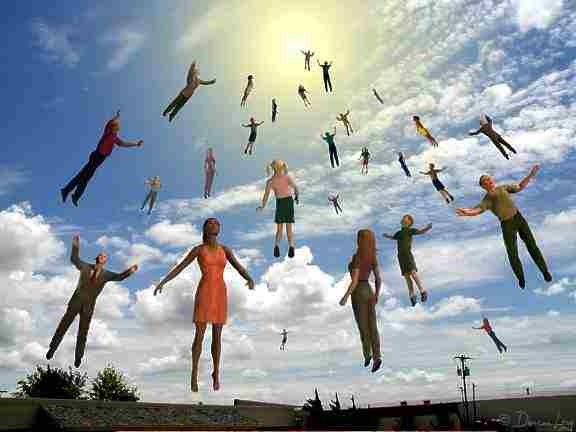 What if today were the rapture (which many Christians don’t believe in and haven’t historically)? What would it mean for you? Let me tell you what it’d mean for me. If Harold were right, my mother would be reunited with her best friend, her mother. My mother might also know more or see more about her two sisters who died at the moment of childbirth. My wife would be reunited with her father who died far too early. And my two daughters would get to meet their grandfather, a great man who loved them before he knew them. And all the other people in our family, deceased grandparents, aunts, uncles, cousins; the whole lot would come together once again, because death has been conquered by Jesus. That’s a little bit of what it would mean for me. But it’s not only about death and resurrection, is it? The Kingdom of God (which is not someplace you go after you die, by the way) is the place where everything is done as the King would have it done. That means, if Harold were right, my daughters, would no longer live in a world consumed with the threat of terrorism, war, or nuclear disasters and/or holocaust, or famine, nakedness, and disease. They wouldn’t even have to negotiate the terrorizing social structure of Junior High School. I wouldn’t see marriages fail and children abused. None of us would be witness to slavery, the mistreatment of women and minority groups around the world. If Harold were right, I’d never again sit next to a hospital bed with a dying parishioner. I performed the funeral for a 7-month old once, watched his mother weep uncontrollably for days, if Harold were right, I’d never have to do that again. If Harold were right, at 6pm tonight there would be renewal breaking out across the globe, complete with a New Heavens and a New Earth. There would be singing on Zion’s glorious summit and the lion would lay down with the lamb. If Harold were right, we’d have a reconciliation celebration. If Harold were right, the Jesus I now see dimly, I would then see face-to-face. Wouldn’t that be good? Doesn’t part of you wish Harold were right? I do! With all the talk about hell recently, we may have looked past the simply fact that the return of Jesus is not, in fact, Doomsday; it’s Joyday, Renewalday, Lifeday, Perfectionday. And we belong to that day! This is the devotional I gave at Redwood Church’s Passion Week service. That night itself was pregnant with the pangs of irony and opposites. As the mob marched with torches and lanterns—in search of The Light. Gathered in anger, anxiety and anticipation soldiers, Priest, police and Pharisees brandish their weapons to make war against the Prince of Peace. Judas backed by army, but lacking integrity, leads the crowd in search of The Way. Men connected by their own desire to snuff out The Life. And of course, in a manner completely opposite of what anyone would suspect, instead of running away, Jesus steps forward. After a night of praying that this moment would not have to come, Jesus does not hesitate to walk the road He and His Father have chosen. The scene is so much different than you’d expect it to be. In the recesses of my mind it has always been like a movie. They’ve got the building surrounded. The roadblock is in place; the city is under siege. Drop the bunker-buster. That’s how you arrest someone that’s dangerous. It’s John Dillinger outside the movie theatre. It’s Elliot Ness racing horseback across the countryside, while the Canadian Mounties rush down from the hills above. But that’s not really what happened here. Sure they thought, no they knew, that Jesus was dangerous. So they send a “detachment of Roman soldiers” to make sure that nothing went wrong. And just in case that wasn’t enough the Jewish Temple police came along for the ride. A detachment of Roman soldiers? That could have been up to 600 men. The chief priest and the Pharisees? That is serious religious and political power. Not to mention all the hangers-on and rubber-neckers. What they were doing tonight was too important. This arrest couldn’t go wrong! But then the one thing they hadn’t planned on happened. When Jesus reveals who He is, it is they who step back and fall to the ground. It in all there clandestine proposals to rid themselves of Jesus, through all the late night planning sessions, back-room deals and political back scratching when the moment comes to apprehend Jesus they find it is they themselves who are arrested. It’s not our Lord who shirks back in the moment of confrontation. It’s not the Christ who suddenly feels the thunder of His heart pounding away in His chest. It is not Jesus whose hands and voice shake and crackle with nerves in the moment of truth. Jesus is captured, not because of their might, but because of His strength. But the question is “why”? One of the things that is so often lost is the fact that Jesus, is not murdered or assassinated. Judas doesn’t hand Jesus over—Jesus hands Himself over. And the Thursday arrest that lead to the Friday of pain, was the mark of our redemption. Because we all live as enemies to the cross. Jesus chose His capture that night. Because in that night, He chose you! Knowing that you weren’t going to be everything that you could have been. Knowing that in your brief time on Earth you would turn away from Him countless times. Jesus knew that we’d speak harsh words to one another, seek out our wants before the needs of others. Jesus knew that we would read and study God’s word and still not do it. He knew that we would break our promises to people we care about. He knew that we would be inclined to make other people suffer before we chose to sacrifice. He knew that we’d rather take than give. I suspect that if Christ had wanted to he could have walked out of the garden on Thursday and avoided the pain of Friday. He could have rallied His supporters and fought the powers. He could have done all of those things and much more and still been Jesus. But He couldn’t have done those things and been Hosanna—the one who saves! Make no mistake about it. Jesus suffers to save us from our sin…and from ourselves. It is His unfailing love, His great compassion that blots out our transgressions. Without Jesus’ choice to suffer the fierce suffering of the cross, we are lost in the woods. We cannot help ourselves. No one here, no one anywhere is good enough to save themselves. This Saturday, September 11th, as a member of Board of Directors for the Peninsula Clergy Network, I am joining clergy from across the Peninsula Bay Area for a ‘Day of Remembrance’, honoring those who suffered and died in the 9/11 terrorist attacks. Our program is simple, at the Redwood City Courthouse, we are providing a space for reflection, remembrance and prayer. There will be no speeches, no stumping, and, thank heavens, no books aflame. There will be men and women there from every faith and creed. Why? Because only the twisted and insane rejoice in death, whichever faith they claim. I don’t believe our silent vigil this Saturday will change much, globally speaking. But I do believe that we can make a small statement about the things we share. If you live in the area, please come out and join me. I’ll be manning the station from 8-9AM, this Saturday, September 11. People question my insistence that preachers should ditch their points. Points, I have argued, are planted and buried with story, whispers and the inspiring word. People don’t need or want step-by-step directions and we’re not interested in the points. Do you need proof? Just think about the last time you read a “User License Agreement” on a computer program. Oh, wait, you didn’t read it. The reason is simple, you want to get on to engagement. Engagement rarely comes in 1…2…3. Below is perhaps the greatest proof ever.